I’ve always felt a little in between, a little bit apart. This year I’m learning that this isn't a bad thing, but something I can use to better understand myself and others. I remember the first time I heard my mum speak Arabic. I was 7 years-old, lighting the menorah in the kitchen as she spoke loudly through the phone to her elderly mother. I didn’t recognize the words — they don’t sound like the Hebrew I’ve learned at synagogue. I ask what language she’s speaking and she tells me Arabic. I didn’t know Jews spoke Arabic. What does it mean to be a Mizrahi Jew? Different from the Ashkenazi Jews who originated in Eastern Europe, and the Sephardic Jews from Iberia, Mizrahi Jews hail from the Middle East and North Africa. My family is from Morocco. Growing up I realized I felt apart from my majority Ashkenazi synagogue; our customs and traditions were simply different. As a Moroccan Jew I knew of henna parties at weddings and Bar/Bat mitzvahs; of the cooking of beautiful breads like Sfenj and Muffaletta; of wearing of the Jelibiya and Kaftans; of my mother speaking Arabic. These things are unique to my understanding of Jewishness, but apart from my family I have not met any other Moroccan Jews or been able to share these experiences with them. I noticed the ways that, in the mostly white seaside town of Bournemouth, England, where I grew up, my mother was treated differently because of the brownness of her skin and her thick accent. I became ashamed of my differences, and as I grew I realised it wasn’t the only thing separating me from my peers. I realized I was queer. On Hanukkah we tell the story of Jews practising their religion in secret for fear of punishment. That was until a group of Jewish rebels called the Maccabees overthrew their oppressors, who had destroyed the temple and sacred oils for the Menorah. The Maccabees managed to find just enough oil to light the Menorah once more, but through a miracle it burned for a full eight days — thus establishing the eight days of Hanukkah. This Hanukkah I reflect on my differences and the meaning of perseverance. On what it means to be bold in your identity, while also feeling loneliness and distance from community, always a little in between. 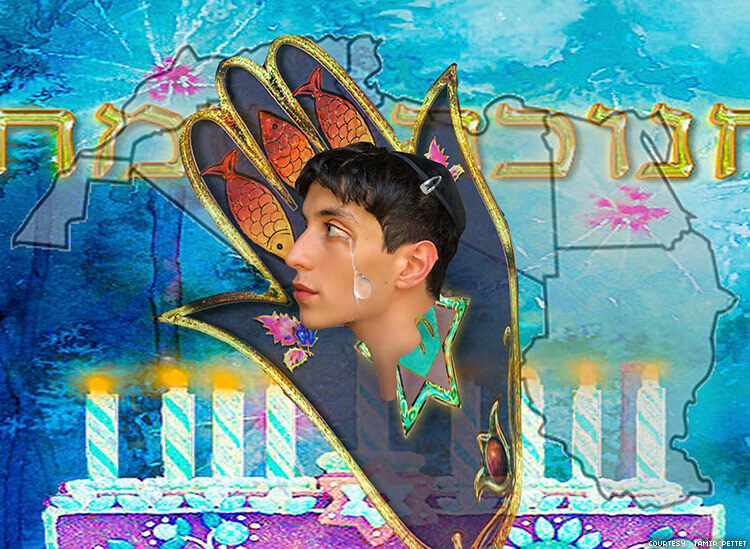 There are only around 7,000 Mizrahi Jews in the UK, and only just over 500 Moroccan Jews, and so the synagogue and pop culture representations of Jewishness are mostly all white, as if we didn’t exist — many don’t even know that we do. Many of my friends had never met a Moroccan Jew, or knew what Mizrahi Judaism was until they met me. It’s a lonely position. Although I connect with other Moroccans, the experiences of the Jewish diaspora in Morocco is a different narrative that I seek to connect with. I can’t help but draw parallels to my queerness: many of us understand the feelings of isolation and loneliness well, of different traditions or customs we have created to survive, whether we grew up with this otherness or that we may still feel it from time to time. On this Hannukah I choose to reflect on these feelings of loneliness but also the pride I feel for my identity. It’s important to pass down histories and traditions (or create new ones) so we can begin to understand ourselves more, whether it’s taking my mum’s shakshuka recipe or hearing stories of queer resistance from an older generation. Hanukkah teaches me to be bold in my identity. To not let oppression define me but be something I can resist. To pass down and teach others and express my culture without fear. It teaches me that celebration and community don’t always have to be right in front of you for you to feel that they’re there. Most importantly it teaches me to use my privilege to stand with others who face oppression, like the Palestinians and Ethiopian Jews who are mistreated by the Israeli government. To give a voice when others may be voiceless. I’ve always felt a little in between, a little bit apart. This year I’m learning that this doesn’t have to be something bad, but something I can utilise to better understand myself and others. I am British but also Moroccan, I am Moroccan and also Jewish, I am Jewish and also Queer, I am the child of an immigrant and sometimes have privilege in passing as not one. My identity is so important to understand, and through it that I am not alone, that I’m part of many things. I will be bold in all of them. Tamir Amar Pettet is an actor, writer and visual artist living in London.